>> How Much Propane Does a Forge Use? Coal and charcoal can be quite cheap but availability is problematic for some, and they come with extra considerations like the ash mess and tending a fire. That isn’t an issue with a propane burner. For this reason, many people chose to go with propane. But how much propane does a forge use? That's not an easy to answer question, since there are a few variables that will affect how fast you go through propane. Factor 1: Number of Burners. Yea, I know it seems obvious, but you will burn more propane if you have a multi-burner setup. For all the numbers below I’m going to assume a single burner. Just multiply by the number of burners you are using. Factor 2: Size of the Forge. If your burner is too big or too small for the forge you are going to turn up the PSI for more flame or turn it down for less. Factor 3: Type of Burner. If you are using the naturally aspirated burners like the DIY ones I show how to build, just a turbo torch, or an air fed burner they will pull different amounts of fuel. 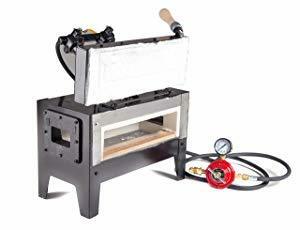 By far the most common hobbyist burner is the naturally aspirated burner design know as the ‘Ron Reil’ style. These will typically work in the 6-10 PSI range. Factor 4: How much pressure (PSI) you are running your burner at. 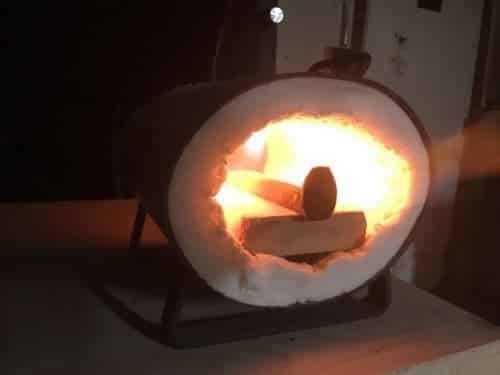 At 6 psi which is commonly the amount of heat needed for most work in a forge sized for the burner (like the Hell’s Forge Portable mentioned above). This heat will get your metal to workable temps quickly and not waste a ton of gas. 10 PSI is a much hotter flame and typically only needed for getting to forge welding temps. This will go through gas almost twice as fast as running at 6 PSI. Factor 5: How well your forge is insulated. If your forge is letting all the heat from the torch just radiate away it will obviously need more flame to get hot enough for doing work. More flame means more PSI. More PSI means more propane used by the forge. Having said all that! We can still ballpark how much propane a forge uses with guidelines based on my own and others experiences. If we assume the most common hobbyist setup, a burner and forge like the hells forge portable single burner running at an average of 8 PSI. A fair guess is that a 20lb tank will last about 7-8 hours. Bigger tanks can obviously go longer. So, how much propane does a forge use? In the end, it’s almost impossible to give exact numbers without knowing the details of your forge set up. But if you assume about 8 hours per 20lbs of propane and then divide by the number of burners you are running you should be in the ballpark for most cases.